Neumann (NeumannBC) — Set the normal component of a Flux (eg, stress, heat flux) along the boundary. Flux whose value is specified across this boundary. Type: A Flux object. Profiles describing the prescribed flux. Type: A FluxProfileSet object, or a list of ProfileXTs, or a single ProfileXT. Edge boundary to which this condition applies. Type: The name of an edge boundary in a mesh. If true, the boundary condition is given in a local right-handed coordinate system where x is the outward normal to the boundary and y is the tangent direction. If false, x and y are lab coordinates. Type: Boolean, 0 (false) or 1 (true). Neumann boundary conditions only apply to Edge boundaries. An edge boundary is composed of a directed series of segments, and this direction determines the definition of the positive normal. If a boundary goes counterclockwise around the perimeter of a Skeleton, then its normal points outward. That is, the unit vectors in the normal and tangent directions form a right handed coordinate system (see Figure 6.87). Neumann boundary conditions are integrated over element edges, and are therefore insensitive to node density. That is, adding nodes to a boundary without changing the boundary condition will not change the effect of the boundary condition. Compare this to Generalized Force boundary conditions, which are applied node by node and are sensitive to node density. The profile parameter specifies the value of the normal component of the Flux along the boundary. The profile is divided into a number of components depending on the dimension of the Flux. If the Flux is a vector (e.g, heat flux) then its normal component is a scalar, and only one profile, p0, must be provided. If the Flux is a tensor flux (e.g, stress), then its normal component is a vector, and two in-plane profiles, p0 and p1, must be provided. Profiles may be arbitrary functions of position, and are specified by providing a ProfileXT object. See FluxProfileSet for details on how to specify multiple Profiles. The normal parameter specifies how the profile components are to be interpreted when the flux normal is multidimensional. If normal is false, then p0 and p1 are the x and y components of the flux normal in the lab coordinate system (x towards the right, y towards the top). If normal is true, then p0 and p1 are the components of the flux in a local coordinate system with p0 normal to the boundary and p1 tangent to it. This coordinate system changes from point to point on the boundary if the boundary is curved. When the flux normal is a scalar, the normal parameter is ignored. 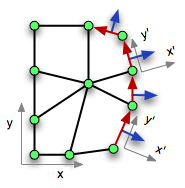 The red arrows joining nodes form an edge boundary. The blue arrows perpendicular to them are in the positive normal direction. The axes labelled x and y are the “lab” axes. The axes labelled x' and y' are the local “normal” axes.